Chalk was formed by the tiny skeletons of marine creatures between 65-100 million years ago! The chalk of the South Downs was formed by marine deposits laid down when this part of Britain was covered by warm, tropical seas between 65 and 100 million years ago, during the Cretaceous period. The layers of chalk also contain bands of flint nodules, a common feature of the walls and buildings within the downland villages. 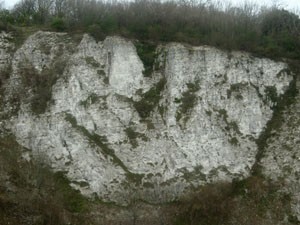 The chalk sits on top of earlier marine deposits of greensands and gault clay, and terrestrial deposits of the wealden sandstones and clays, all laid down during the 45 million years before the chalk. These layers (or ‘strata’) were pushed up and folded into a huge dome by the same powerful geological processes that formed the Alps. The porosity of chalk is one of its most notable properties. Rain is largely absorbed through tiny, connected pores instead of lying on the surface and forming rivers, lakes and ponds. When the thin soil is full of water, the rainfall slowly moves down through the porous chalk. 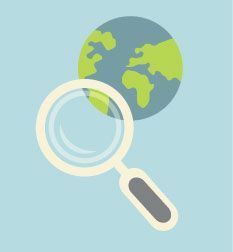 The water stored in any rock is called groundwater. It is topped-up by rainfall in the autumn and winter. The rock is saturated when it is thoroughly soaked with water. It is because of its porosity that the natural outlines of the chalk are smooth and curved into convex hill tops and concave valleys. In the South Downs, there are two major aquifers; the Chalk and the Lower Greensand. They provide over 75% of the public water supply in this area. An aquifer is a rock that has fissures (little cracks) and tiny holes called pores which can hold water like a sponge. Rain soaks into these pores instead of lying on the surface. 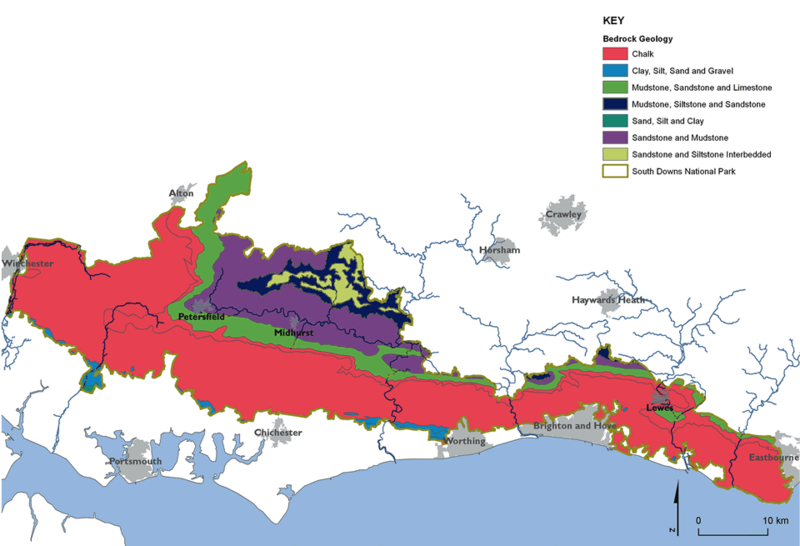 Groundwater from the aquifers is very important because it keeps the rivers flowing and supplies water to wetlands such as Amberley Brooks and Pulborough Brooks.